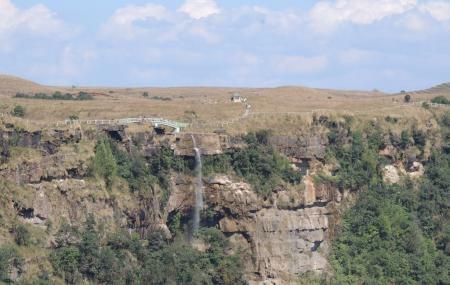 The large terrain of the“Eco Park” in Meghalaya is another important attraction here. This park was established by the Meghalaya government in the plateau and is home to several hybrid and indigenous orchids in the Green House donated by Shillong Agri-Horticultural Society. This park also offers breathtaking view of distant Sylhet Plains of neighbouring Bangladesh. The seven sister falls (Nohsngithiang fall) originates from here only. Eco Park is a view point to see the Bangladesh plains. The Eco Park also houses a wide variety of orchids, courtesy the Shillong Agri-Horticultural society. How popular is Eco Park? People normally club together Don Bosco Shrine and Dain-Thlen Falls while planning their visit to Eco Park. Love the place. It's a must go place for visitors & kids will enjoy the place as there is a Play ground for kids. It's mainly a view point &in monsoon some water falls came to life, that makes the place more beautiful. Nice and adventurous. Have enjoyed a lot. Inside of this cave is dark and you have to be very careful while passing it through. Ticket price is RS 20 per adult however you have to pay RS 60 if you are less than three people. Good place to visit. Can spend an hour walking around and watching all the different waterfalls one can see from there. You can also see Bangladesh from here. Carry your own binoculars for better view or they provide you with binoculars for sightseeing at the cost of 10₹ per person.